interdisciplinary artist with a background in literary theory, has picked up my reporting and commentary on the upcoming auction of four works by the City of Denver and moved the ball down the field. After analyzing the documentation provided in my posts related to the violation of donor intent regarding the gift of Clyfford Still‘s oeuvre to the City of Denver for its new Clyfford Still Museum and citing examples of Clyfford Still’s fierce insistence on tight control over his work, Colosi cites another crucial bit of evidence (which I had missed) on this deal gone wrong—the press release (posted on the Still Museum’s website [scroll down]) that was issued in August 2004 by Denver’s then Mayor John Hickenlooper. 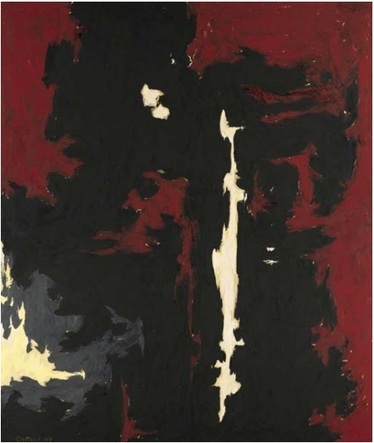 —The City must maintain, exhibit and handle the Collection in accordance requirements of the Will and Agreement [which include the explicit no-sale stipulations from both Clyfford’s and Patricia’s wills]. —The City must raise or otherwise designate funding sufficient to procure the museum and provide for a maintenance and operation endowment. Having failed in its obligation to raise an endowment, the city plans to monetize four works that were intended for the museum, for an estimated $51-71.5 million. Same back at you, David. Your article should be required reading for the Denver City officials who are on the brink of misusing four works that were entrusted to their care.